Stepping back: What have we learned about agriculture and climate change, and where do we go from here? Cattle grazing on an allotment east of the Owyhee River Canyon, Oregon. Used with permission via Flickr from the Bureau of Land Management (CC BY 2.0). As a number of large climate-and-agriculture projects at our Pacific Northwest universities have come to an end over the last year, we felt it was time to step back and take stock. Our projects have included dryland wheat farming, anaerobic digestion systems for dairies, and improving understanding of the interactions among carbon, nitrogen, and water at the regional scale. Now that they are complete, what have we learned? Where should research and extension go from here? In an effort to prioritize and catalyze future regional research and extension efforts, we worked with partners to host a workshop titled “Agriculture in a Changing Climate” (March 9-11, 2016). The event brought together a diverse set of stakeholders—university faculty and students, crop and livestock producers, and individuals representing state, tribal and federal government agencies, industry, nonprofit organizations, and conservation districts—to summarize what we know, identify challenges and gaps, and define priorities for moving forward. Since that workshop, a group of us have been working together to continue to synthesize recent research findings and identify priorities related to climate mitigation and adaptation in the Northwest, and the product of that work is now freely available as an online article. Summary of the direction of predicted change based on overall vulnerability index and agreement among modeled elements (described further in Reeves et al. 2017) for 2060 under emissions scenarios for US rangelands. Highly resilient (green) indicates that the overall index score was relatively high and agreement among all of the four biophysical indicators is also high. Likewise, highly vulnerable areas received a low index score and there was agreement among all four indicators is high (red). What is the take-home message in terms of what we know, you may ask? Here are some highlights from our discussions around livestock systems. For at least some production systems, the existing evidence suggests climate impacts may be less severe in the Northwest than for other agricultural regions in the United States. However, that is not consistently true across the board (the same applies to cropping systems). 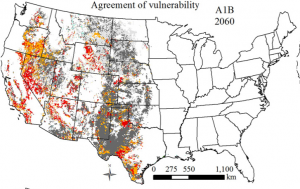 Recent analyses suggest that Washington, Oregon, and Idaho are all likely to exhibit higher levels of rangeland vulnerability by 2060 (and beyond) than they have in the past, with more negative impacts in our region than in the northern Great Plains (Reeves et al., 2017). Meanwhile, dairy systems are expected to fare comparatively well compared to other regions of the country (see Liz Allen’s article on this topic). Even in these systems, however, other challenges need to be considered. If our regional dairy production increases, the need to effectively manage manure nutrients and reduce greenhouse emissions, or to improve the resilience of forage production to climate change may take on new urgency. Moving forward, research and extension should address the specifics surrounding these issues. Priorities we discuss in our synthesis article include developing and sharing information to support efforts to cope with heat stress and drought, improve rangeland soil health, and reduce emissions and recover nutrients from manure. Similar to these highlights for livestock systems, our synthesis includes an analysis of what we’ve learned and what the priorities are moving forward for cropping systems in the Pacific Northwest. We also discuss what is needed to make decision support systems that help producers and others incorporate climate change considerations into all manner of agricultural management decisions. And last but in no way least, we focus on the partnerships among researchers and practitioners, what they’ve contributed so far, and where improvements can make a greater difference moving forward. Take a look at the full article, and let us know what areas strike a chord, so we can discuss those further in future AgClimate articles. Not all the identified priorities are new, but the process we went through and the challenges agriculture faces certainly highlight the need for continued investment in interdisciplinary research around these priority topics. We need to continue to bring together social, economic and biophysical sciences in strategic collaborations across the spectrum of researchers, outreach specialists, and practitioners, and continue to work together to develop and share knowledge so that research can directly support all kinds of decisions made by the agricultural sector in the Pacific Northwest. 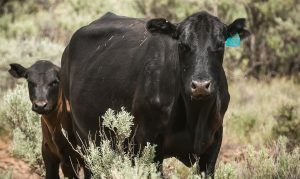 We are striving to move forward on these research and extension priorities, with projects that include (a) highlighting grazing management that improves resilience to climate change, (b) evaluating technologies to recover manure nutrients that help producers overcome the economical and logistical challenges that have impeded adoption at scale, and (c) developing approaches to better understand and reduce trade-offs between food, energy and water. As these projects come to fruition over the next five years, we will continue to share and discuss what we find in future articles. Stay tuned! This article is also posted on the Agriculture Climate Network blog.